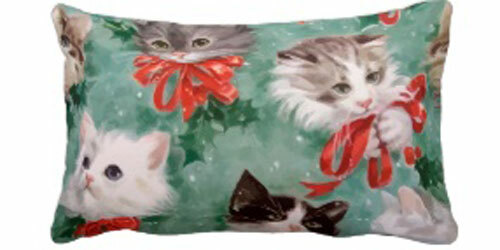 The delightful world of Christmas is even more charming when you mix in cats and kittens. Such fun times are captured in these decorative accent pillows for your holiday home decor. 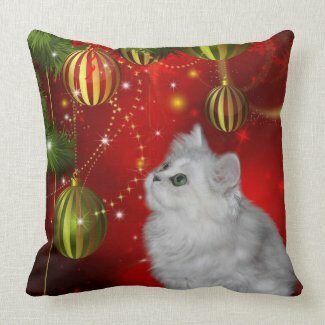 Cats and kittens all decked out for Christmas make a charming accent to any home. 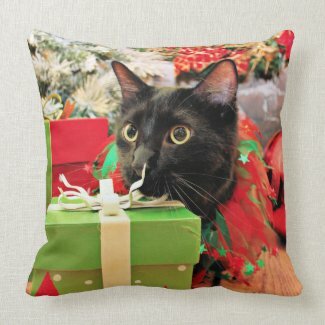 Cat lovers and animal lovers alike will certainly enjoy one of these delightful pillows with the image of a curious cat ready to celebrate the holidays with you. 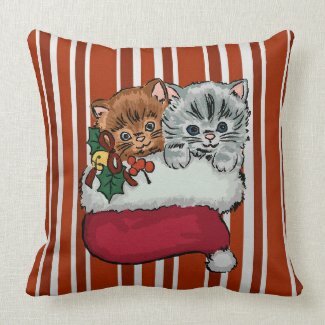 If a more whimsical look is one that you prefer, these cute kitties are ideal choices for adding more home decor for the holidays. 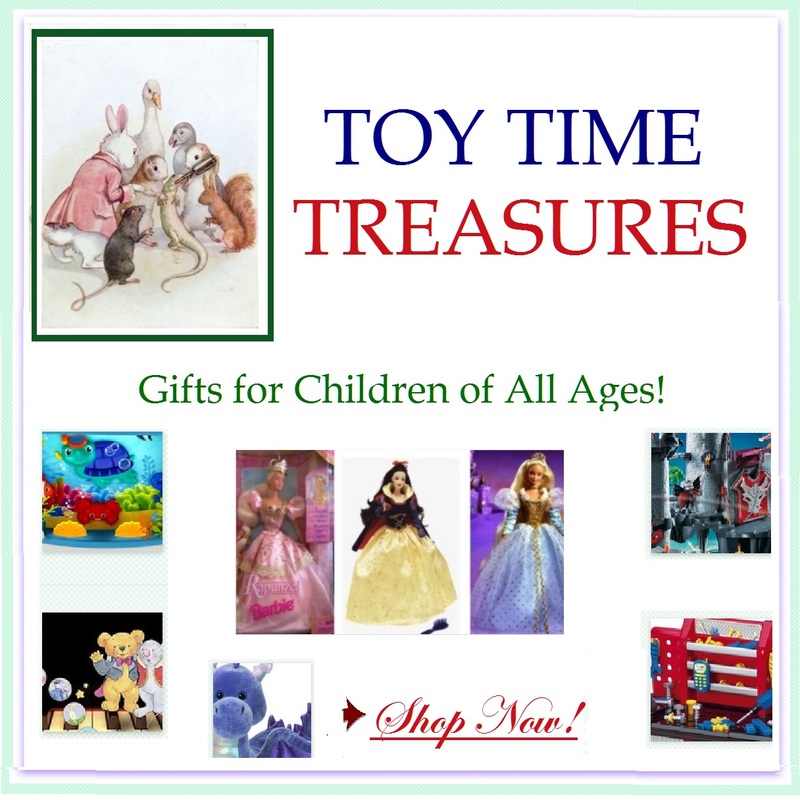 Whether you like a home with lots of Christmas decorations, or you like to have only a few accent pieces, a cute cat as part of your decor is a special accessory. Anyone who has ever been owned by a cat, knows full well what the decorated Christmas tree means. Cat toys swinging from the branches. How many of us have awakened in the morning to find all the ornaments from the bottom limbs strewn across the floor. For me, it’s even been the whole tree toppled over at times. 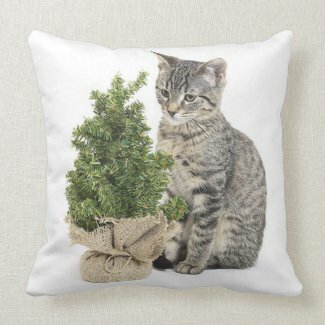 Celebrate the joy of cats and Christmas trees with one of these charming decorative pillows for your home. Adding holiday decor to your home is a tradition that most of us enjoy. It’s a special time in my world when I start pulling out the Christmas decorations for the season. Every year I pick a few new items to add in my collection. Decorative pillows have been part of my decor for many years and I love adding in a new one. Set on the corner of the couch or propped on a side chair, Christmas accent pillows are charming additions. Enjoying the antics of cats during the holiday time is all the better. 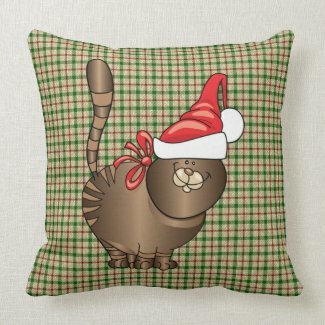 These Christmas cat pillows are too cute! The thing I love about a holiday throw pillow is that it’s easy decorating but it makes an impact! 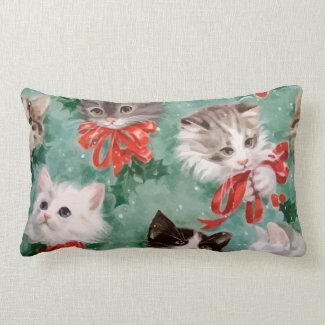 Oh, these really are adorably charming kitty Christmas pillows! They are all so precious. I believe I could easily find a home for all of them!